The company is betting big on blockchain. Google, the hipster of the tech world, was into blockchain before it was cool. Between 2012 and 2017, when some people were only just learning about the blockchain and what they could do with it, Google was acquiring blockchain startups and pumping millions of dollars into others. Only one other company invested more money into blockchain in that timeframe. 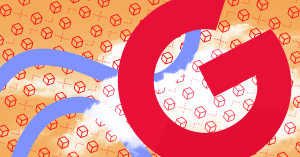 In 2016, Google opened its cloud server to blockchain developers. Now, Google may be close to reaping the benefits of those years of research and funding. Industry insiders have told Bloomberg that Google plans to embrace a blockchain-like ledger system to support its cloud business. Using the cloud is like renting a storage unit. You pay a certain amount of money in exchange for a certain amount of space, only the space is on a company’s servers and not in some shady gated facility. Instead of unused furniture, you store data, and instead of a padlock, you use a password to protect your valuables. However, a determined thief could crack the padlock on the storage unit, so too could a savvy hacker break into your cloud storage company’s servers to access your data. Blockchain would make that kind of break-in impossible. Companies have taken a number of different approached to blockchain-based cloud storage, but the idea is that your data is “decentralized.” Instead of stashing your rock collection in your one storage space, you could store each rock in a different locker. You could even duplicate the rocks just to be safe, and then store those in different lockers. In a blockchain-supported cloud system, your files are the rock collection. The data gets broken into bits, stored on a bunch of servers, and you’re the only person with the key needed to put the pieces back together. With the damage caused by major data hacks still fresh in the public consciousness (looking at you, Equifax), Google could use the promise of blockchain’s near-impenetrable security to draw customers away from companies offering less secure, traditional cloud storage. And Google has even figured out a way to make money off other would-be competitors. An anonymous insider told Bloomberg Google also plans to release a white-label version of its system. That means third parties could offer customers the same system Google provides, but on their own servers and with their own branding, and would have to pay Google to do it. After all, why develop your own blockchain-based cloud storage system when you can just buy Google’s? Of course, Google isn’t the only company exploring blockchain for cloud storage. The company hasn’t shared a release date for their system, so a competitor — another major company, even a startup — could bring their product to market first. But it’s hard to imagine that Google wouldn’t immediately become the dominant player in this field when its service does launch. After all, the company has done its blockchain homework.